Most people on this planet blithely assume, largely without any valid scientific rationale, that humans are special creatures, distinct from other animals. 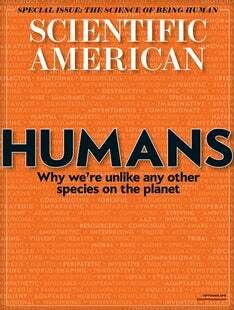 Curiously, the scientists best qualified to evaluate this claim have often appeared reticent to acknowledge the uniqueness of Homo sapiens, perhaps for fear of reinforcing the idea of human exceptionalism put forward in religious doctrines. Yet hard scientific data have been amassed across fields ranging from ecology to cognitive psychology affirming that humans truly are a remarkable species.